The K-2 Reading Foundations Skills Block is a one-hour block that uses a structured phonics approach, grounded in the Phase Theory of Dr. Linnea Ehri, which describes behavior related to the types of letter-sound connections students are able to make as they learn to read and write. As such, the block is meant to ensure that, by the end of grade 2, students acquire the depth of skills they need in the Reading Foundations standards to navigate grade-level text independently. The lessons and assessments explicitly address the Reading Foundations standards, as well as some Language standards associated with spelling and letter formation. Read "Implementing the K-2 Skills Block"
Watch Kindergarten and Second Grade classrooms teachers prepare, assess and group students, select and manage materials, and foster students' self-management and smooth transitions during differentiated small group time. Implementing the K-2 Reading Foundations Skills Block from EL Education on Vimeo. 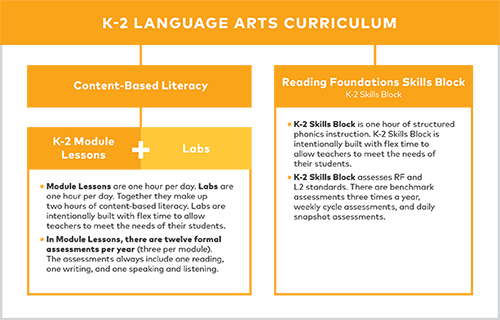 Like the Module Lessons and the K-2 Labs, the K-2 Reading Foundations Skills Block is divided into four modules that span a full school year. The first module is 6 weeks long and the remaining three modules are eight weeks. Each module includes five-day “cycles,” with four days focused on repeated instructional practices and one day on assessment and goal setting. 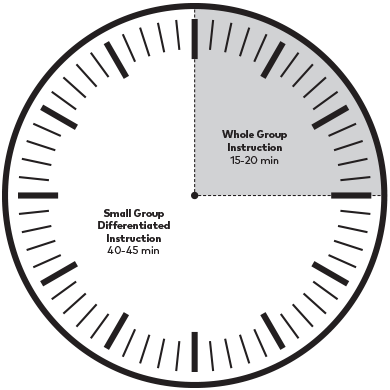 Each module includes a Flex Week to be used at the teacher’s discretion. Flex Week: All modules include a Flex Week to be used at the teacher’s discretion. Considerations might include: scheduling challenges (e.g, holidays, teacher work days, etc.) and students’ needs (e.g., re-teaching). Benchmark Assessments can be administered at the discretion of the teacher, school leader, or school district. If possible, Beginning-of-the-Year Benchmarks should be administered before instruction begins. Benchmark results are particularly important for teachers to use as they group students and plan for Differentiated Small Group instruction. If Middle-of-the-Year Benchmark Assessments are administered between Modules 2 and 3, consider using Flex Days from each module to make up for this time, as necessary.